Sometimes even the worst games have some redeeming quality, a nugget of awesomeness, if you will, that makes slogging through the abysmal forest of bad design decisions ultimately worth a go. As far as third-person shooters go, Mindjack is a bland, uninspired mess of vague sci-fi clichés, dull characters, and sloppy gameplay implementation. It's excruciatingly mediocre at its best moments and downright infuriating at its worst. But as much as we wanted to rip the disc out of the damn console and light it on fire at numerous moments, Mindjack has a few extremely cool concepts floating around amongst the refuse that kept us playing. Set in 2031, this cyberpunk tale has you play as a hi-tech government agent who gets wrapped up in a grand conspiracy revolving around mind control and evil corporations. The story itself is pretty shallow and hard to follow, thanks to its reliance on nebulous, awkward flashback cutscenes to fill in many of the gaps. However, the game does have droves of killer cyborg gorillas with machine guns mounted on their backs, so at least it has that going for it. 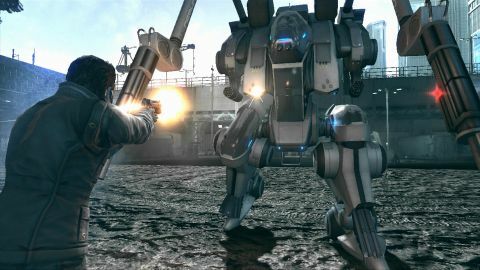 There’s plenty of action and intense gunfights along this very linear romp through warehouses, facilities, and other nondescript cityscape settings. You pick up a standard gamut of weaponry, blast the crap out of many similar-looking enemy troops, and wind your way through one short stretch of enemy-filled terrain after another as the plot progresses. Experience points unlock various perks you can plug into your character, but leveling-up doesn’t otherwise increase your health or stats. Mindjack’s only real unique gameplay twist comes in the form of badass psychic hacking abilities. Provided you’re close enough to them, gunned-down human and robotic enemies in your immediate vicinity can be mentally enslaved with the tap of a button, forcing them to get back up and join the fray as your allies. There’s a limit to the number of baddies you can wield in this way at one time, but it’s possible to get a solid squad of renegade foes together to lend a hand, create useful distractions, and soak up extra bullets for you. You can also “mind hack,” which essentially lets you exit your current character and hop into another available NPC or comrade’s body to control them. This can be a slow process at times, though it provides fun tactical amusements. We got a huge kick out of hopping into the skin of cowering workers located outside of the immediate firefight and using them to gun down our foes from behind. If one of your main characters is downed, it’s possible to hop to the next one and revive yourself. The game only ends if all of your core comrades are incapacitated. Mindjack's main campaign isn't worth suffering through as a solo offline experience, though playing the campaign online as the “host” with the multiplayer functionality engaged does make things far more interesting. When getting started in a session, you can decide whether you want to allow other players to “hack” into your game. From there, you’ll just go about business as usual in the main storyline – until someone pops in at random and decides to spice the action up. Other players first appear in the form of floating energy clouds. Blue energy clouds are friendly players who can help out by hopping into your NPC comrades and joining the battle. Red energy clouds are enemy players that want to stick it to you and prevent you from progressing through the current stage. They can hop into any of the numerous foes on the battlefield, making your task much more challenging and much more exciting. Up to six players can play in a given sequence at one time, and when a three-on-three grudge match breaks out in the middle of an already hectic battle sequence full of enemy troops, the chaos and flying bullets can make for a lot of fun. It’s also possible to turn the tables and jump into other players’ games to shake things up. As interesting as the hacking gimmick and multiplayer mechanics are, the game’s other numerous flaws drag things down into the abyss. Enemy AI is dim as hell (foes will often run right by you to attack a comrade as you shoot them in the back of the head at point blank range), the wonky cover system often has you shooting bullets into nothingness even when it appears they should be hitting your targets, and there’s no way to pause the game. When you add badly-voiced characters, drab environments with little personality, and repetitive shooter gameplay to the pile, Mindjack’s few unique elements don’t shine enough through the muck. The few cool concepts found in this sci-fi shooter are buried beneath a mountain of drudgery.